One Book One County is a community read program for Wells County held in September and October every year. The program is designed to create a countywide discussion by encouraging all residents to read the same book. There are also a number of special events at the library related to themes found in the featured book and potentially an author visit. 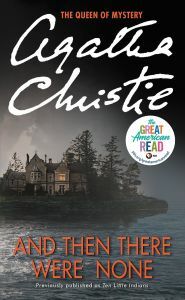 This year’s book title is “And Then There Were None” by Agatha Christie. The title was chosen from a pre-vote of Wells County’s Favorite Book on the Great American Read list put out by PBS. We have several events during the months of October and November going on to help celebrate One Book One County. See more details in the Upcoming Events section on this page. One of the most famous and beloved mysteries from The Queen of Suspense—Agatha Christie. It’s very easy! Just stop by the Main Library or Ossian Branch to get a copy of the books or check out the eBook or eAudiobook at the Northeast Indiana Digital Library. Then start reading. That’s it! If you’d like to join us to talk about the books, you are welcome. Please register at the library and pick up a book at that time. Past community reads include “Rocket Boys” by Homer Hickam, “The Art of Racing in the Rain” by Garth Stein, “Room” by Emma Donoghue, “The Reading Promise” by Alice Ozma, “The Bone Garden” by Tess Gerritsen, “Where Am I Eating? An Adventure Through the Global Food Economy” by Kelsey Timmerman, “The Adventures of Tom Sawyer” by Mark Twain, “A Place Called Hope” by Philip Gulley, and “A Walk in the Woods” by Bill Bryson. This program is presented by the Wells County Public Library with financial support from the Friends of the Library.